Anti-abortion crusader, arranged for a protester to confront President Clinton with a bottled fetus. May 1992: "The authorities in Wichita will wish for Operation Rescue back, after dealing with the Lambs [of Christ]. I love the Lambs. They play hardball." March 1993: "It is time for Christians to rise up against the ATF." August 1993, Fort Wayne, IN: "I want you to just let a wave of intolerance wash over you. I want you to let a wave of hatred wash over you. Yes, hate is good. [...] Our goal is a Christian nation. We have a Biblical duty, we are called by God, to conquer this country. We don't want equal time. We don't want pluralism. Our goal must be simple. We must have a Christian nation built on God's law, on the Ten Commandments. No apologies." December 1997: "I believe that Clinton is the most wicked and vile President that this nation has ever had." 2000 (regarding abortion providers): "When I, or people like me, are running the country, you'd better flee. Because we will find you, we will try you, and we'll execute you. I mean every word of it. I will make it part of my mission to see to it that they are tried and executed." May 2004: "If there is no God, then it would be ludicrous to oppose homosexual behavior or abortion." October 2009: "The homosexual marriage movement and the child-killing movement are the 'Cultural Axis of Evil,' and must be defeated. President Obama is again showing his contempt for his Christianity." Terry's family values are firm: He disowned his son Jamiel after he came out as gay in 2006, and never spoke to him again; Jamiel was killed in a car wreck in 2011. He has also had no contact with his daughter Tila since she had a child out of wedlock. 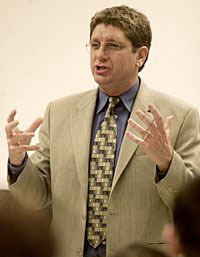 In Spring of 2010 Terry began hosting a daily syndicated television show of political commentary and humor, called Randall Terry: The Voice of Resistance. Has campaigned for federal office as a nominal Republican (1998, 2006) or Democrat (2012), strictly for publicity.